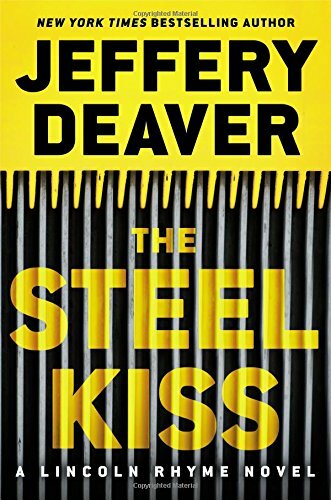 A gripping thriller featuring everyone’s favorite forensic scientist, The Steel Kiss by Jeffery Deaver also delivers a subtle warning of the dangers of overreliance on modern electronics. Indeed, Deaver’s subliminal message about how helpless the consumer is when confronted by a psychopathic hacker intent on subverting the purpose of an ordinary electronic product such as a microwave oven, a table saw, or a car into a weapon of destruction, is more frightening than the race to identify a serial killer before he kills again. Rhyme’s belief in forensics is challenged when an escalator accidentally malfunctions, resulting in the gruesome and prolonged death of an innocent man. Rhyme is hired by an attorney who is representing the wife of the victim to discover why the escalator malfunctioned, and if there is a basis for a product liability case against the manufacturer. It not Rhyme’s usual kind of case, but the widow is destitute. Rhyme’s lover, Amelia Sachs, NYPD homicide detective, is also interested in the escalator but for a different reason. She was there in the mall when the escalator’s repair panel accidently opened, letting the victim, Greg Frommer, fall into the machinery. It is Amelia who is holding Frommer’s hand when he dies. The answer to Sandy Frommer’s question is that we cannot know, especially if the product has an embedded computer that controls its functions, such as remotely turning off the pilot light on a gas stove. These embedded computers can control the brakes on a car, the water temperature in a hot water heater, or even the braking system on a car. An individual can hack into these embedded computers and turn almost any product into a deadly weapon. The case of Unsub Forty and Rhyme’s hunt for the reason the escalator malfunctioned become one when Rhyme’s new intern and fellow quadriplegic, Juliette Archer, reads a blog that warns of the dangers of the new embedded systems that can be hacked by anyone who knows how. The author of the blog is one of Unsub Forty’s victims, which means that the blogger was not a random victim; he was targeted. The logical conclusion is that the escalator did not accidently malfunction; it was deliberately targeted by Unsub Forty so that he could escape during the ensuing confusion and panic. The question in both Amelia’s and Rhyme’s minds is motive. Why is Unsub Forty deliberately and seemingly randomly targeting individuals who have nothing in common? If Amelia does not have a large enough task in her pursuit of Unsub Forty, several domestic and personal issues distract her. Her mother, Rose, is scheduled for bypass surgery; Amelia is still angry at Rhyme for retiring as a consultant for the NYPD; and her former lover and former cop, Nick Carelli, turns up on her doorstep after he is released from prison, begging her to help him prove his innocence of the crime that sent him to prison several years before. Intermittent chapters from Unsub Forty’s point of view provide a portrait of a man whose rare, genetic physical condition makes him the target of bullies as well as constricting his social life. His contempt for “Shoppers,” conspicuous consumers of electronic products, drives him to sabotage such products to warn against rabid consumerism. Calling himself The People’s Guardian, he publishes his manifesto. He speaks often about his Toy Room and describes the various tools he keeps there, speaking of showing it to his shy girlfriend, Alicia. The only critical comment to make is that Lincoln Rhyme’s OCD at times overwhelms his emotional responses. He is so focused on evidence, on papers, fibers, fingerprints, plants—on material things—that he misses or overlooks how people around him react. Yet this is consistent with his behavior in earlier books so should not surprise his fans. What is not often mentioned, and for which Deaver deserves accolades, is the fact that Lincoln Rhyme provides such a wonderful role model for quadriplegics.